Hawaii's soil is hostile to horses. These volcanic islands haven't been covered by the ocean for millions of years collecting the huge mineral deposits found on the North American continent where the ancestors of equines evolved. Hawaii's soils don't contain the right mineral balance and many of our pastures are on former sugarcane plantations which left the soil saturated in arsenic, herbicides and pesticides plus they are full of sweet grasses, fruit trees and toxic weeds. Identify and control the forage in your pastures and eliminate all guava, avocado and fruit trees. The only safe dried greens in our local feed stores are grass and alfalfa hays and alfalfa hay cubes. (Alfalfa is a legume and has the lowest starch and sugar content. The seed heads in hay are grain.) Cubes are like sponges and must be completely covered with water and soaked at least 20 minutes until they have completely re-hydrated (Oat-alfalfa cubes contain some oats) All the feeds imported to Hawaii are compromised by sitting in hot containers on docks, sometimes for months, plus a long, tropical sea journey during which time the mold & fermentation have already started, especially processed feeds containing grains, sugars and molasses. Alfalfa is not an ideal fodder for horses but it doesn't mold as easily. Moldy feed is the #1 cause of colic in Hawaii. Add 1/4 cup ACV daily to diet. Use real apple cider vinegar! Do not use Heinz (distilled from corn with apple flavoring). Soak alfalfa cubes with water/vinegar. Benefits of apple cider vinegar: Prevents growth of bacteria, mold and myotoxins; contains potassium to flush toxins; balances pH and insulin levels; helps prevent colic and ulcers; neutralizes mineral imbalance; flushes extra calcium and protein in alfalfa cubes; oxygenates blood; aids digestion; promotes healthy hoof growth and glossy coat. Everything that horses eat shows up on the walls of their hooves. Horizontal, raised insult rings are a sign of dietary overload episodes that take weeks to appear. The equine system is not designed to digest sugars, processed foods or the Non-Structural Carbohydrates (starches) found in packaged, processed feeds. Studies prove that they destroy the healthy bacteria essential for digestion in the cecum and prevent the absorption of minerals. Equines spent millions of years evolving up near timberline in the arid Rocky Mountains subsisting on maximum roughage with minimum nutrition such as scrub grasses and mountain sagebrush while foraging up to 20 miles a day between water and mineral deposits. Feed All Horses Like They Are Diabetic (Insulin Resistant) Practice Zero Tolerance and know that it's better to be safe than to be sorry. 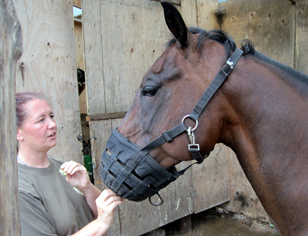 Horses are designed to eat at ground level which stimulates their saliva to release digestive enzymes. Feed hay and cubes on clean, rubber mats and position buckets lower than chest-level. We have evidence that horses occasionally founder in the wild from an overload of sugars when they might find berries or an apple tree as well as starches from sweet grasses. Because their digestive systems haven't been compromised by humans and their feet are tough capsules worn to the proper angles, the feral horses recover quickly. Just one overload of NSC's or sugars can trigger a serious laminitic episode in a domestic horse who is overweight and whose feet are distorted and compromised by iron shoes. It often takes weeks for the symptoms to appear and lameness to develop while by then, we have forgotten about that one "special" treat we gave our horse which actually triggered the laminitic episode. Horses are foragers, not grazers. We force them to live in confinement without the variety of grasses, herbs, barks and shrubs they would find on the continents of their evolution. Our grasses in Hawaii are high in sugar and can cause pasture founder year-round. A grazing muzzle slows down the most voracious appetite. Mocha models how she can still eat a treat of alfalfa cube through her grazing muzzle. Her guardian says it was a clear choice, "Muzzle her or she dies!" Healthy hooves begin with the right nutrients! "If we as professional veterinarians are uncertain about the facts concerning a controversy, we are likely to put ourselves in someone else's hands who appears to have authority. Power to command this authority is in the hands of commercial advertisements that promote these special products with misleading messages. Marketing is aggressively aimed at veterinarians and owners alike. There is a profit motive for veterinarians to sell these diets. The public has a nutritional mania and preoccupation with diet in our society. Dietary change has assumed the status of medical treatment using such terms as intervention, maintenance, and correction. The profession and the public do not appreciate that advertising claims come without proof in the case of diets. Owners can easily be enrolled to accept such diet change because they feel they are involved in doing something constructive. Professional responsibility has been lost in this case. The situation can remind us that we are part of an uncritical profession with little review or standards." We need to know the rules in order to break them wisely. This information is intended only for the clients of Hawaii Natural Hoofcare and is validated by the definitive study, "Clinical Outcome Of 14 Obese, Laminitic Horses Managed With The Same Rehabilitation Protocol" published by the Journal Of Equine Veterinary Science, February 2014.